“As of October 1, 47 out of 54 African countries have submitted their national plans for the UN climate deal (INDCs.) Africa’s vast and environmentally diverse landscape and coastal areas mean that each of its country’s climate action plans vary widely and can include comprehensive emission reduction plans, sectoral targets, policy frameworks, regulations and other tools such as carbon markets, subsidies and incentives. South Africa's proposes that its emissions will peak by 2025, plateau until 2035 and thereafter decline. Morocco, for example, has proposed an increase of solar power to a 14% share in its electricity generation capacity by 2020. Among their climate action pledges, African countries have made some bold and strong targets, showing their fierce commitment to reducing global emissions. Ethiopia, one of the first African countries to submit has pledged: a 64% reduction on business as usual emissions by 2030. And Comoros has made the most ambitious target of an 84% reduction in emissions by 2030. Such bold commitments show that Africa’s potential to reduce emissions is great, even though it has contributed the least to building these levels in the first place. With Africa bearing the brunt of climate change impacts, adaptation has been given as much focus as mitigation in countries’ targets. Adaptation is crucial to protecting and promoting development gains, especially in Africa. One thing is for sure, and seen in common throughout all of Africa’s climate action plans: all pledges are premised on getting the means of implementation and adequate resources from developed nations. Not just in terms of finance, but in technology transfer and enhancing the capacity of African nations to meet their climate pledges. Whatever policy measures we put in place cannot be at Africa’s cost alone. It’s affecting the whole world, everyone is affected, and we all have to chip in. Civil society in the north must start to unite and put pressure on their governments to commit to a fair and just agreement for the world, not just for Africa. African civil society will be holding their governments to account on committing new resources from national budgets for investment to help people adapt and build climate resilience. As well as getting the necessary contributions from other countries, strong leadership and coordination amongst responsible agencies is imperative to guarantee their effective implementation and to achieve the intended levels of ambition. It’s certainly a huge step in the right direction that so many African countries have taken affirmative action to contribute to this landmark global deal and have shown their commitment to climate action. These action plans should empower and support our people to build their resilience to the devastating impacts of climate change. The INDCs are an important part of an ongoing process. World leaders must deliver strong commitments to close the funding gap and help Africa adapt to the devastating effects of climate change. They should ensure that Paris delivers a fair, ambitious and binding deal at a level adequate to stop climate change and keep global warming well-below 1.5°C. Yet with two months to go until countries aim to strike a global climate pact in Paris, collective commitments do not meet the internationally agreed limit of 2C. Governments will need to focus on revising their goals from 2025 onwards to avoid the catastrophic effects of climate change worsening still. 1/10 - Sierra Leone: Pledges to keep emissions "relatively low" (close to 7.58MtCO2e) by 2035, or achieve neutrality by 2050, conditional upon international support. 1/10 – Guinea: A 13% reduction on emissions by 2030, compared to 1994 levels, excluding land use and forestry, conditional upon international support. 30/9 – Lesotho: An unconditional 10% reduction in emissions compared to a business-as-usual scenario by 2030, or a conditional reduction of 35% by 2030, dependent on international support. 30/9 - Guinea Bissau: Aims to boost renewables' share of the energy mix to 80% by 2030 and develop a national reforestation programme by 2025. Section on adaptation includes to increase protected area coverage from 15 to 26%. 29/9 – Swaziland: Aims to double the renewable share of its energy mix by 2030, compared to 2010 levels. Also pledges to develop a national emissions inventory, baseline and business as usual projections, in order to draw up a national mitigation goal by 2020. 28/9 - Burkina Faso: An unconditional pledge to reduce emissions by 6.6% below business-as-usual levels by 2030, with a further 11.6% reduction conditional upon international support. Includes interim pledges for 2020 and 2025. 28/9 – Gambia: A 44% emissions cut by 2025, compared to business as usual projections, and a 45% cut by 2030. 24/9 – Eritrea: An 80.6% reduction in emissions by 2030, compared to business-as-usual levels. 39.2% of this is unconditional, and can be financed using domestic resources. Pan African Climate Justice Alliance is a continental coalition of Civil Society Organizations from diverse backgrounds in Africa, that aims at unifying and coordinating isolated civil society efforts on climate change advocacy in Africa, so as to ensure that pro-poor and people-centered response measures are given attention as governments in Africa seek to mainstream climate change into national poverty reduction and sustainable development strategies and actions. Founded in 2008 and with a membership of more than 1000 organizations and networks across Africa, the alliance has emerged as the most vibrant and largest Civil Society platform on climate change and sustainable development in Africa and on the global level. The Pan African Climate Justice Campaign is a joint initiative of the ACT Alliance, PACJA and Oxfam. 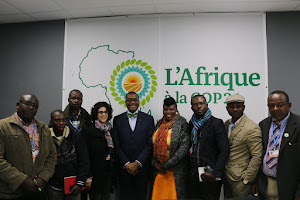 The campaign targets African and Global leaders ahead of the 2015 Paris Climate Conference. The Caravan will interact with various faith communities along the way to mobilise vulnerable communities across Africa and create awareness on issues of Climate Change. It also expects to raise one million signatures aimed at putting pressure on global and national leaders to act urgently and sustainably on the impact of Climate Change on the world and in Africa in particular. To play your part: sign the Africa People’s petition as part of the international campaign Act Now for Climate Justice. By signing this petition, your support will be added along with thousands of other people from all over the world and presented to world leaders as they agree a global climate agreement this November.